The horse-like creature was classified as belonging to Eurohippus messelensis, a now-extinct genus of equids—the taxonomic family to which horses, donkeys and zebras belong. The horse is thought to date back to the Eocene Epoch, which lasted from about 56 million to 34 million years ago. The fetus, which scientists believe to be the oldest of its kind, measures 4.9 inches in length, with almost all of its bones present (apart from the skull, which seems to have been crushed). The researchers believe that the mare died shortly before it could give birth, but that animal's death was unrelated to childbearing. Significantly, soft tissue from both the mother and fetus has been preserved. The researchers believe they have tissue from the placenta — that supplied the fetus with nutrients from the mother's uterus — as well as from uterine ligament that connected the uterus to the mother's vertebrae and the pelvis. 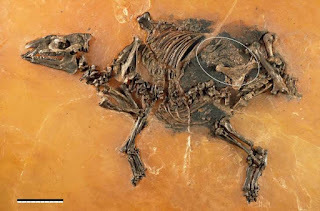 The discovery suggests that the reproductive system in the ancient horse-like animals was very similar to that of modern descendents, according to Jens Lorenz Franzen, a paleontologist at the Senckenberg Natural History Museum in Frankfurt and the paper's lead author. On the other hand, says Franzen, a lot else has changed in the last 48 million years. For example, horses of the Eocene Epoch would have had four hooves on each forelimb and three on each hindlimb, making a total of 14 hooves. Now, horses only have four hooves. "You can imagine the amount of evolution which took place...during those 48 million years but the [reproductive] system, in so far as we know it now, was already present at that time," says Franzen. He says the reproductive system may have developed during the Paleocene Epoch—between 66 million and 56 million years ago—or even during the time of the dinosaurs in the Mesozoic Era, which lasted from about 252 million to 66 million years ago. The original discovery was made by a team from the Senckenberg Museum. According to UNESCO, the Grube Messel is the world's most important fossil site for understanding the Paleogene Period, which includes the Eocene Epoch and stretches from 66 to 23 million years ago. The Paleogene is also the period during which the first modern mammals emerged. Most mammals are placental, meaning that they bear live offspring that are nourished prior to birth in the mother's uterus via the placenta. Some 4,000 species are placental mammals, including horses, dogs and humans.